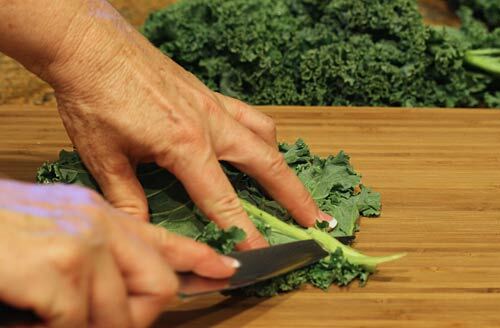 If you haven’t tried preparing kale this way than you are missing out on a great treat. I honestly had no intention of posting this recipe on this blog because it has been floating around on the internet for over a year or more, and I felt it had already been done to death. 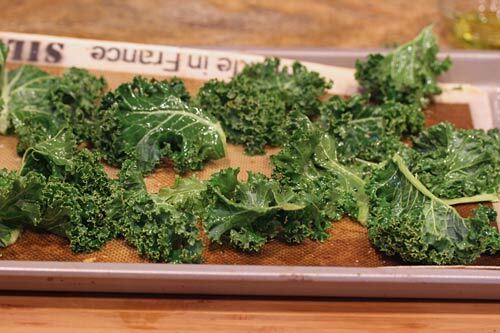 I had my sister-in-law visiting recently though, and prepared these tasty crisp kale chips for her and she was amazed at how delicious, healthy and easy they were. She felt I should share the recipe for all those who haven’t stumbled upon it yet, so here it is. These chips are highly addictive, so if you are having guests, I’d buy an extra bunch of kale (or two) so everyone can fully enjoy them. I’ve tried a number of varieties of kale for these chips and they all worked out fine, but I prefer to regular old curly leaf kale best for these. I thin down the thick center vein before I bake the kale leaves to ensure everything crisps up at the same time if my leaves are large. 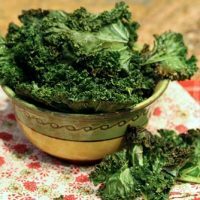 These chips are exceedingly easy to make, and as long as your kale leaves are very dry before you rub them in oil and bake them you can’t go wrong. Just keep an eye on them as they bake as once they are crisp, they can turn brown very quickly, and you don’t want them brown. You can season them with some dried chili flakes, or grated cheese if you want to be adventurous, but I prefer them simply with a sprinkling of sea salt. 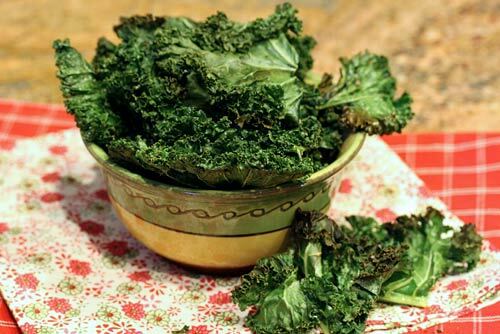 These tasty crisp treats made from fresh kale leaves are highly addictive, so make lots! Wash the kale, and tear the leaves into bite sized pieces. If you are using leaves with the center vein, use a sharp knife to trim it. Use a salad spinner to completely dry the kale, or pat well with paper towels. 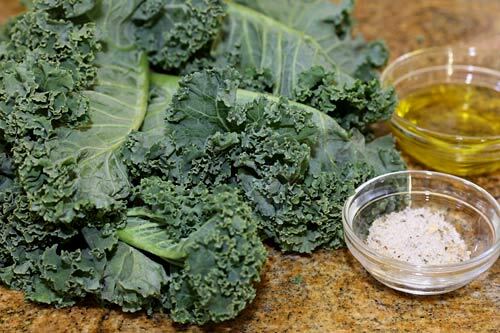 Place the kale on a baking sheet and drizzle with olive oil. (I like to gently rub the oil over each leaf to ensure good coverage). Sprinkle with some seat salt. Bake for about 12 to 15 minutes, until edges just begin to brown and kale is crispy when touched.